They write of their whisky that it is “The Worlds most richly flavored Scotch Whisky” and it is hard to deny that it is quite a powerfully flavored dram. A very rich drinking experience, but… what are the flavors that are so richly expressed? I will see. “There are 3 main ingredients for making Laphroaig – Barley, Water, and Yeast, but the secret ingredient is the People.” Laphroaig (La-froyg) is the story of a community. An uncompromising, tough and determined group of people who work to ensure that this defining whisky has always remained true to its origins.These origins can be found in Islay itself – its harsh climate and tough landscape have created a hardy people whose single-mindedness and honesty is as distinctive as Laphroaig. They have some really great videos that detail pretty explicitly what makes Laphroaig what it is and also helps to educate on much of what goes into the Scotch making process (some of it specific to Islay). They are relatively short, well made and I think very much worth watching. I give them a lot of credit for taking the time and effort to produce such worthwhile videos. It also details the association that they have with the Makers Mark distillery in the U.S.. They really give a great introduction into how much work goes into the glass that you carefully enjoy! 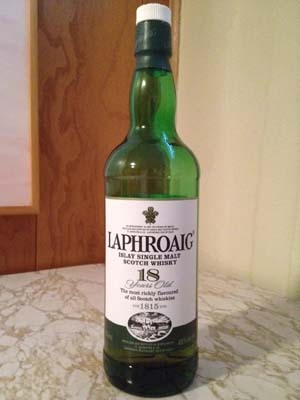 The 18 Year Old expression of Laphroaig is made in limited quantities each year. It is bottled at 48% ABV and is non-chill filtered for a depth of taste and texture. It retails for between $75 – $85. It has a pretty forgettable appearance. Relatively light (from a lack of coloring and lack of darker wood) and with not a hint of cloudiness which is nice. Subdued and a bit feminine but doesn’t want to make its appearance particularly stand out. Nothing distracting or unpleasant, just that the appearance doesn’t really make a powerful statement. Nose: Smoked bandaids! Yes. And it slaps you across the cheek. I have heard it said (and have experienced it myself) that when a bottle of heavily peated Islay Scotch is opened, you can smell it across a large room. Smoke (peat) and bandaids (the iodine in the water). These very powerful aromas do take front and center on the nose, but let it open and let your nostrils relax a bit (from the gentle pummeling that they initially get) and there are also freshly picked apricots, candied sugar, old horse saddle and stable, parsley, mint, day old mown grass, white chocolate and Afgani incense. What at first is an overpowering and singleminded nose, opens up to be quite complex and beguiling… actually inspiring memories you have had or perhaps will have. Oh and very little to indicate the 96 proof. Very little heat. Ultimately a very complex and intriguing nose. Taste: Relatively creamy mouthfeel. Rather nice, loose and easy flowing yet substantial at the same time. Fruitcake… yes a very rich fruitcake comes through in the middle. A rich deeply sugared nuttiness and well cooked peaches, pears and oranges. Orange peel comes through in the middle and then comes back at the end. Yes orange peel is a defining characteristic. Only for a brief moment (it awakens and then it is gone) does the heat of the 96 porof express itself here at the end. Some dark chocolate almonds as it is leaving and much muskiness and stickiness at the end. Very oily and tongue coating. Will take some doing to get this off of the breath. The finish doesn’t really leave you.. it almost doesn’t “finish”. Very sticky with burnt and spicy sugar at the end. Balance: I would say it has a unique but definite balance. It announces itself like a Sherman Tank in the beginning, opens up to aromas that tell you there is something really interesting going on that you need to release yourself to, develops a tasty creaminess, relaxes for a bit and then hammers its way home. It starts and finishes BIG and presents a pretty complex story in between. Overall, this Scotch has serious flavor. It is not timid or subdued, it hits you and says “if you are willing to sit back and go along for the ride.. there will be a lot to experience and you will remember it for some time!” But is it flavor that I would want to continue to go back to on a very regular basis? I don’t think so.. but for me high peat Islay Scotches have always been for unique occassions (when I really want to be pushed into something big), for times when I want to only drink Scotch and not have much with it (I question how many types of food there are that would pair well with this) and for when I want to smoke a cigar. Peat and iodine go great with cigars for some reason. They are all powerful aromas and flavors and they work very well together. A glass of this 18 year and a great Churchill on a sunny Fall afternoon would be a very good way to spend a Fall afternoon! 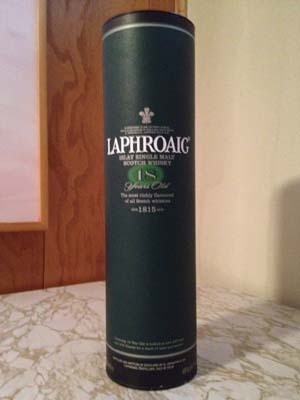 This is a complex, rich Scotch that cannot be contained and has flavors that work very well for me on certain occasions but not so much on others. 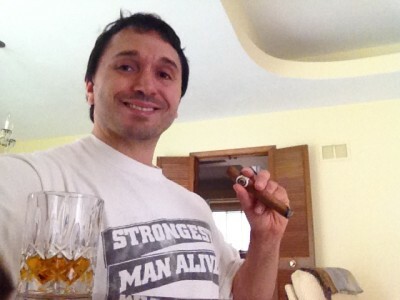 This entry was posted in Liquor Reviews on June 30, 2013 by Chris M.